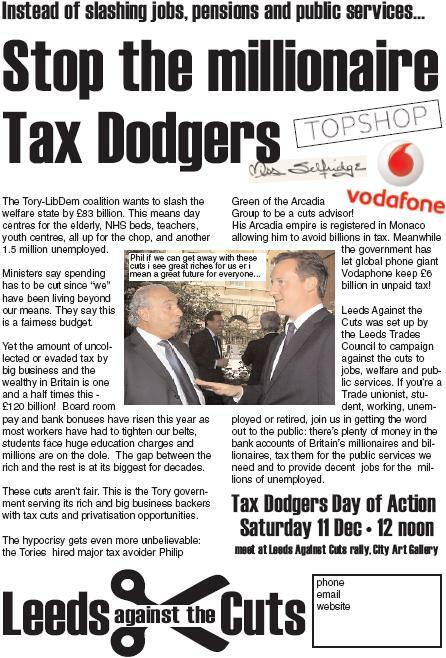 The Leeds Against the Cuts group have called for a demonstration on Saturday 11 December 2010 at 12:00 specifically focused on the issue of Tax Justice. The hypocrisy of the coalition government needs to be exposed. HMRC has accepted that over £40 billion in tax is lost to fraud and avoidance every year. PCS and many other tax analysts believe that this figure is much higher in the region of £120 billion. The cuts aren't inevitable and the coalition government needs to stop unnecessary tax repayments and close all tax avoidance loop holes. George Osbourne can start by paying the correct amount of tax himself and by ensuring that Philip Green the owner of the Arcadia group and government advisor of the cuts pays his fair share of tax too! The Leeds Student Occupation in Leeds have been handed an eviction notice for tomorrow, 8am Wednesday 08 December 2010. They are calling on all supporters and trade unionists to rally in solidarity with the occupation at 7:30 am tomorrow morning. The occupation should be a symbol for all of us against the coalition cuts and a strong show of solidarity for the students will bolster our movement. Below is a Youtube video of Ian Pattison speaking at the Leeds Against the Cuts Public Rally on 25 November 2010 about the need for unity between workers and students against the cuts. Leeds Against the Cuts Public Meeting on Thursday 25 November 2010. The Leeds Against the Cuts Public Meeting on Thursday 25 November 2010 was well attended and a success for the group to build on. The speakers invited all spoke passionately against the cuts and gave strong reasons why they were unnecessary and were only for the benefit of the rich members of society. There were many more speakers as well and I am currently in the process of uploading their videos to youtube and will blog post again when they are up.